Modern medicine still fails to explain processes that operate in self healing diseases. We may thus distinguish between two kinds of processes that operate in the body: explained, and unexplained. The latter operate in self healing diseases, and are either ignored by medicine or called placebo. Hippocrates regarded such processes as healing force of nature and the task of the physician was to assist the healing force. Unexplained processes in physiology were coined by Starling and Cannon, Wisdom of the Body (WOB). This concept is applied here for a rational treatment of processes involved in health and in disease. WOB is an attribute of live organisms. It directs growing plants toward sunshine, guides amebas to avoid noxious agents, and determines the behavior of higher animals. It is essential for individual survival and was molded by Natural Selection. During evolution WOB encountered all diseases and knows how to heal itself, and anticipates all diseases. The main task of the WOB is to maintain health, and improve its qualify. It controls processes in the body so as to make them healthier. The WOB has its own language and should be considered when examining the patient. Although health is the main concern of medicine its exact meaning is not at all clear. Medicine is more concerned with non-health, known as disease. Yet not every disease may be regarded as non-health. Many young adults have in their arteries arteriosclerotic plaques without any apparent health deterioration. Are these plaques non-health and should they be treated? Obviously health and disease are not complementary. How then to handle diseases that do not impinge upon health? Sophisticated technology reveals slight aberrations that in the past were unknown, e.g., mild hypertension, a slightly elevated blood sugar, or breast cancer precursor lesions. Are these aberrations real diseases? Modern technology confronted medicine with a new problem, how to deal with aberrations in a patient that feels healthy? Technology revealed also that diseases evolve. They start as small aberrations without clinical manifestations, while the patient feels healthy. Advancing technology reveals more and more pre-clinical aberrations, and medicine lacks clear guidelines for dealing with them. To wait until they become more pronounced is generally regarded as malpractice. Medicine presumes that the traditional guideline "primum non nocere" results from ignorance and helplessness, and is not advised. Yet technological innovations endow this concept with a new meaning, e.g., "Do not harm, and don't interfere until the aberration ripens for treatment". Medicine adopted also the philosophy of technology, according to which physico-chemical laws control the organism in health and in disease. It is the philosophy of "Homo Faber" that applies laws of machines to the organism. A small aberration is therefore a malfunction, that should be corrected whenever found. True, the patient with a minute arteriosclerotic plaque feels healthy, yet his sensations are deceiving him, and he has to be told that he is ill. While in the past sickness drove the patient to seek help, today he learns from his physician that he is ill, and he is advised to be periodically screened for malfunctions. Medicine has always been blessed with self healing diseases, e.g., flu, common cold, or minor aberrations that are cured by the organism. Self healing cannot be explained by physico-chemical laws. It does not fit the philosophy of Homo Faber and is therefore ignored. Hippocrates called it the healing force of nature (vis medicatrix naturae). The role of the physician was to assist the healing force during treatment. Guyenot regarded the organism as "first among physicians" (1,2). Modern medicine attributes such notions to ignorance. Yet ignorance prevails also today. Technology revealed that the organism is extremely complex, and that physico-chemical laws still fail to tackle the complexity of life. By abandoning the healing force, modern medicine ignores an important facet of the healing process, known as placebo. A medical dictionary defines placebo as "any dummy medical treatment; originally, a medicinal preparation having no specific pharmacological activity against the patient's illness." (3). Suppose that you gave aspirin to a patient with a flu, and he gets better. The theory of medicine, (here pharmacology) fails to explain why he gets better, and calls the aspirin effect placebo. Yet the effect is real, and beneficial. Hippocrates would attribute it to the healing force of nature. Modern medicine, on the other hand sees it as a useless dummy, since lacking specific pharmacological activity. In other words, medicine ignores this effect since it cannot be explained by the pharmacological theory (4). We may thus distinguish between two kinds of processes that operate in the body: 1. Processes that are explained by the medical theory, and 2. Unexplained processes, or placebo. While processes of the first category are explained by physico-chemical laws, unexplained processes will always evade such reductionistic approach. They and their interactions are overwhelmingly complex, and cannot be reduced further. Unexplained processes intrigued two renown physiologists, E. H. Starling, and W. B. Cannon. Starling realized that even if all physiological processes in the body were understood, we still could not explain how they are controlled. This knowledge he attributed to the wisdom of the body (WOB). This was also the title of Cannon's physiology book, which introduced the notion of homeostasis (5). WOB accounts for all processes that operate in the body, explained and unexplained (6). WOB is an attribute of live organisms. It directs growing plants toward sunshine, guides amebas to avoid noxious agents, and determines the behavior of higher animals. It is essential for individual survival and was molded by Natural Selection. According to Darwin's theory of Natural Selection, each live being on earth is best qualified to live on this planet otherwise it would have been replaced by a more qualified. In other words the wisdom of today's live forms is most adequate for their survival in the present circumstances. From the medical point of view, since agents causing disease are part of the environment that "selects the best fitted organisms", during evolution WOB encountered all diseases and knows how to heal itself. It anticipates all diseases, and is therefore "the first among physicians" (1). The relationship between explained and unexplained processes is illustrated on the hypothalamic-pituitary axis (Fig. 1). Black arrows, represent explained processes, e.g. hormonal feedback. Gray arrows, represent the effect of the organism on the axis, which is generally unexplained. Since all components maintain homeostasis, hormonal treatment involves explained as well as unexplained processes. The negative feedback of cortisone is mediated by two routes, explained, e.g., pituitary, and hypothalamus (black arrows), and unexplained (gray arrows). In the above flu patient, the beneficial role of aspirin might be mediated among other via the gray arrows, with "no specific pharmacological activity" like any placebo. The WOB concept serves here for a rational evaluation of unexplained processes in healing. Whatever aspirin does to a flu patient, it is mediated by the WOB that directs diseases in their course, and the role of the physician is to assist it. Unconscious messages inform the WOB on the functioning of the organism, e.g., metabolic homeostasis, extra-pyramidal system, neuro-vegetative system, immune system, and cell turnover. Some messages are transmitted to our consciousness, e.g., hunger, thirst, pain, and feeling ill. Other messages are regarded as synonyms, e.g., malaise, lassitude, prostration, weariness, weakness an tiredness. However they belong to an intricate language that ought to be explored. Even seemingly obvious messages, like headache confuse medicine. In a hypertensive patient, headache is meaningful to medicine, since being explained by the elevated blood pressure. The same headache when occurring in daily life is meaningless since not accounted for by explained processes (7). Since the WOB is involved in health and disease, its language should be taken seriously when examining the patient. An interrogation of the WOB would reveal that many aberrations that are regarded by medicine as diseases, are not regarded as such by the WOB, otherwise it would have transmitted to the consciousness a sense of being ill, or at least a feeling of distress. According to Leriche: "Health is life lived in the silence of the organs" (1). We may thus distinguish between two kinds of diseases: 1. Aberrations in a healthy (or silent) organism, and 2. Aberrations in an organism that feels sick. Both are regarded by medicine as genuine diseases. To the WOB only the second type is a real disease. Who is right? Medicine views the organism as indolent. It has to be told, rescued and screened. Such efforts may be iatrogenic, and contrary to the nature of WOB. Here lies the main therapeutic difficulty of modern medicine. It does not act in agreement with the WOB. The main task of the WOB is to maintain health, and improve its qualify. It controls processes in the body so as to make them healthier. This control is even more intricate than the control of homeostasis itself. It is best likened to the task of a conductor. The orchestra is made of music creating processes (musicians), and the conductor's task is to improve the performance of the orchestra. While the conductor aims at aesthetics, the WOB aims at improving health. The orchestra could play without a conductor, yet its performance would deteriorate. So does the organism, it is capable of maintaining different homeostatic levels, each endowed with a different health quality. For instance at one occasion the organism (or its homeostasis) might be tired, or it may be hungry, and even feeling ill. As the WOB attempts to drive the organism (homeostasis) to the healthiest condition, it instructs the tired organism to rest, the hungry organism to seek food, and the ill organism to seek medical help. Both tasks, that of the conductor and that of the WOB, cannot be expressed by physico-chemical laws. When attending his patient, the physician actually interferes with the task of the WOB. He ought therefore attempt to integrate in the "orchestra of the organs", which he may achieve only by understanding the WOB (8). 1	Canguilhem G. Le normal et le pathologique. translated into English by Fawcett CR, Cohen RS.Zone Books New York 1991. 2	Zajicek G. Th normal and the pathological. Cancer J. 1994;7:48-49. 3	Dorland's Medical Dictionary. 27 th Edition. WB Saunders Co Philadelphia, 1988. 4	Zajicek G. The placebo effect is the healing force of nature. Cancer J. 8;2:44-45. 5	Cannon WB. 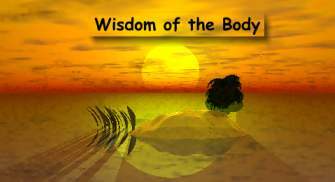 "The Wisdom of the Body". Norton, New York, 1932. 6	Zajicek, G: Wisdom of the Body. Cancer J. 1994; 7: 212-213. 7	Zajicek G. The language of the wisdom of the body. The Cancer J.1995; 8:291-292. 8	Zajicek. Normative medicine, Med. Hypotheses. 1995;45:331-334.